Five people have died in Turkey after Kurdish PKK rebels launched two separate attacks on a police station and railway, officials said. 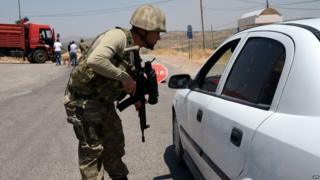 Two officers and two PKK fighters died in the police station raid in the southern town of Pozanti on Thursday. In the eastern province of Kars, the rebels bombed a railway line and then fired at repair workers, killing one. The attacks are the latest in a sudden upsurge in violence after a fragile two-year ceasefire broke last week. Turkey began launching airstrikes against PKK targets in northern Iraq last week, after a Turkish policeman and civilian were killed in an attack in the mainly Kurdish city of Diyarbakir, for which the PKK claimed responsibility. The strikes have prompted a renewal of open hostilities with the Kurdish group, which wants greater independence from Ankara for Turkey's Kurdish minority. The two police and railway worker killed on Thursday bring the the number of deaths in Turkey since violence resumed to about 20 - chiefly members of the security forces. Turkish intelligence sources, cited by Hurriyet newspaper on Thursday, said they believe as many as 190 PKK fighters have been killed - and 300 wounded - in airstrikes. Many governments, including Turkey, Britain and the US, classify the PKK as a banned terrorist organisation. Turkey's fight with the PKK is complicating the US-led war on the Islamic State group, for which the US has relied heavily on Syrian Kurdish fighters affiliated with Turkey's Kurdish rebels. Turkish Prime Minister Ahmet Davutoglu said strikes against the PKK will continue until the group surrenders, despite calls from Turkey's main pro-Kurdish political party for the resumption of peace efforts.